How does your succulent garden grow? Whether you cultivate a pretty little dish garden, a rustic log planter overflowing with succulents, or a trio of concrete planters with large fleshy-leafed specimens, succulents have never been more trendy than now. The wide range of succulent colors, textures, and forms provide gardeners with a myriad of ways to update fairy gardens, living wreaths, and vertical planters. Learn about nine succulents that you can add to any sunny window as a low-maintenance houseplant option. Anyone who has observed the trailing rickrack patterned leaves of the Epiphyllum anguliger plant will find beauty in the foliage alone, but the fantastic orchid-like flowers that sometimes appear are the icing on the cake. Unlike some succulents, the fishbone cactus appreciates a humid environment. However, the plants get by on partial sunlight or filtered light. 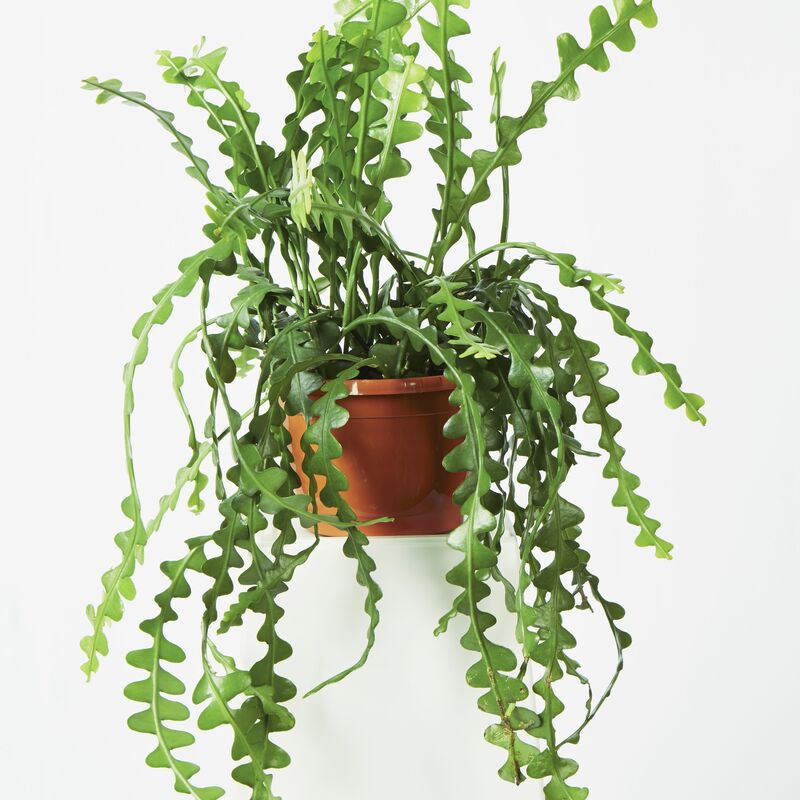 The trailing habit of the fishbone cactus makes it ideal for hanging baskets, or a sturdy container on a pedestal. The large, overlapping leaves of Crassula perfoliata are a striking feature of this two-foot tall native of South Africa. If you give your propeller plant an outdoor vacation in bright sunlight in the summer, you might coax the plant into producing its long-lasting bright red flower clusters, which resemble those of the penta plant. Sharp drainage is essential for this succulent, which can suffer from fungus in damp conditions. The Gasteria genus features low-growing, stemless succulents that make wonderful additions to a dish container grouping, as they are slow growing. Try "Little Warty," which gains its "so-ugly-it's cute" character from bumpy growths on its leaves. Ox tongue plants like a half day of sun and weekly watering, so long as you don't let moisture accumulate between the leaves. Haworthia attenuata is the kind of succulent whose bark is worse than its bite, as the plant has a spiky look but not thorns or sharp spines to threaten an inquisitive touch. The white tubercles that give the plant its name distinguish them from similar-looking aloe plants. Zebra plants grow in low clumps, and look striking in small containers tucked in with light green reindeer lichen, or in mini glass hanging terrariums. Reduce watering during the semi-dormant winter state. Unlike many succulent houseplants, the Aeonium arboreum does not like hot weather, and may go dormant if temperatures rise above the 80's. This makes the pinwheel desert rose a suitable houseplant, as it thrives the the same 65 F to 75 F zone that people enjoy. Plants have a rapid growth rate and can reach three feet in height. If the plant gets too leggy and a stem breaks off, you can replant it, as roots form along the stems. Use regular potting soil for these succulents, as they need some moisture for their shallow root systems. 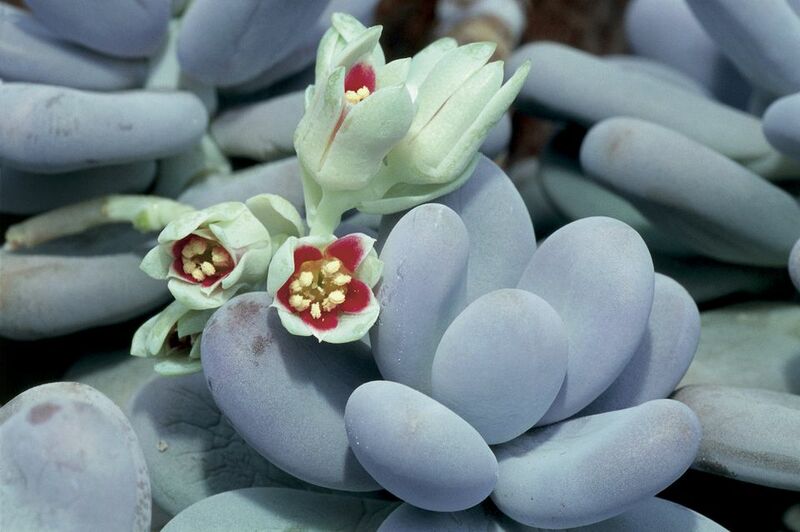 If not for the charming name alone, you should give moonstones a spot among your succulent collection for their otherworldly bluish-green globular leaves. As Pachyphytum overferum has adapted so well to extremely dry conditions by storing water in its leaves, you should water sparingly, twice a month in the summer resting period, and once a week in the active growth time of winter. These Mexican plants tolerate a wide temperature range, from freezing to triple digits. Also known as the necklace vine, Crassula perforata is a relative of the common jade plant, and is just as easy to grow. Eighteen-inch plants grow in a sprawling fashion, and look good at the edge of a mixed dish garden. String of buttons plants tolerate some shade, but like at least a half day of bright sun in a south or east-facing window. Plants are vigorous and easy to propagate through division. The petite plants of Frithia pulchra deserve a spot on the windowsill where observers can get a close look at their unusual tubular leaves. Baby toes plants need some attention given to their watering needs: they like regular irrigation, yet the soil needs to drain very freely to avoid rot problems. Give the plants all the sunshine you can to encourage the daisy-like blooms to appear in summer. Gardeners who like their landscape sedums should try this one just for indoor hanging baskets. Sedum morganianum produces many trailing stems packed with pudgy leaves. A strong light source, weekly watering, and good drainage will help stems reach their two-foot potential.